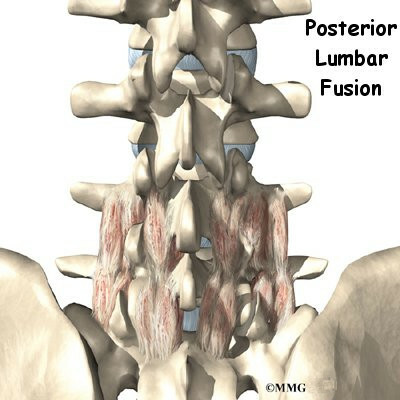 A posterior lumbar fusion is the most common type of fusion surgery for the low back. A fusion is a surgical procedure that joins two or more bones (in this case vertebrae) together into one solid bone. The procedure is called a posterior fusion because the surgeon works on the back, or posterior, of the spine. Posterior fusion procedures in the lumbar spine are used to treat spine instability, severe degenerative disc disease, and fractures in the lumbar spine. Other procedures are usually done along with the spinal fusion to take the pressure off nearby nerves. They may include removing bone spurs and injured portions of one or more discs in the low back. Most surgeons also apply metal screws and rods, called instrumentation, to hold the bones securely while they fuse. What parts of the back and spine are involved? Surgeons perform this procedure through an incision in the low back. The incision reaches to the spinous processes, the bony projections off the back of the vertebrae. The surgeon must move aside the muscles along the spine, called the paraspinal muscles. The fusion itself involves the lamina bone, the protective roof over the back surface of the spinal cord. In some cases, the surgeon may enlarge the neural foramina, the tunnels where the nerve roots leave the spinal cord. The main goal of the spinal fusion (also known as an arthrodesis) is to stop movement of one or more vertebrae. Keeping the fused section from moving helps stop mechanical pain. 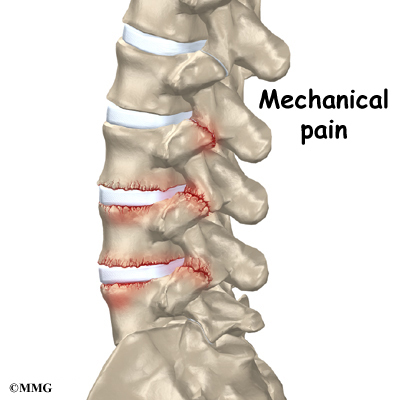 Mechanical pain occurs when damaged discs and joints that connect the vertebrae become inflamed from excessive motion between the vertebrae. This type of pain is commonly felt in the low back and may radiate into the buttocks and upper thighs. The spinal nerves are also affected by too much vertebral motion. They begin to rub where they pass through the neural foramina and become swollen and irritated. Also, the neural foramina narrow when a vertebra slides too far forward or backward over the vertebra below. This immediately pinches the nerves where they pass through the neural foramina. Nerve swelling, irritation, and pinching produce neurogenic pain. This type of pain often radiates down one or both legs below the knee. Fusion stops this harm to the nerves. By fusing the vertebrae together, surgeons hope to slow down the process of degeneration at the fused segments and prevent future problems. During surgery the patient usually kneels face down on a special operating table. The special table supports the patient so the abdomen is relaxed and free of pressure. This position lessens blood loss during surgery. It also gives the surgeon more room to work. An incision is made down the middle of the low back. The tissues just under the skin are separated. Then the small muscles along the sides of the low back are lifted off the vertebrae, exposing the back of the spinal column. Next, the surgeon takes an X-ray to make sure that the procedure is being performed on the correct vertebrae. The surgeon first removes any pressure from nearby nerves. This may involve removing part or all of the lamina bone. (The lamina forms the back portion of the bony ring covering the spinal canal.) Then the surgeon takes out any disc fragments and scrapes off nearby bone spurs. In this way, the nerves inside the spinal canal are relieved of additional tension and pressure. The nerve roots are checked to see if they move freely in the spinal canal and as they leave the spine through the small holes between the vertebrae, the neural foramina. If not, the surgeon may cut a larger opening in the neural foramina. This procedure is called foraminotomy. To prepare the area to be fused, the surgeon shaves a layer of bone off the back surfaces of the spinal column. The cut bone bleeds. The surgeon makes a second incision at the hip. Small strips of bone are removed from the top rim of the pelvis. This is called a bone graft. The surgeon lays the bone strips over the back of the spinal column. When the bone graft contacts the bleeding area, the body heals (or fuses) the bones together just as it would a fractured bone. During posterior spinal fusion, the surgeon also fixes the bones in place using a combination of metal screws, rods, and plates. This instrumentation (or hardware, as it is sometimes called) holds the vertebrae to be fused together and prevents them from moving. The less motion there is between two bones trying to heal, the higher the chance they will successfully fuse. The use of instrumentation has increased the success rate of spinal fusions considerably. A drainage tube may be placed in the wound. The muscles and soft tissues are put back in place, and the skin is stitched together. The surgeon may place you in a rigid brace to support your spine while it heals. Infection following spine surgery is rare but can be a very serious complication. Some infections may show up early, even before you leave the hospital. Infections on the skin's surface usually go away with antibiotics. Deeper infections that spread into the bones and soft tissues of the spine are harder to treat. They may require additional surgery to treat the infected portion of the spine. 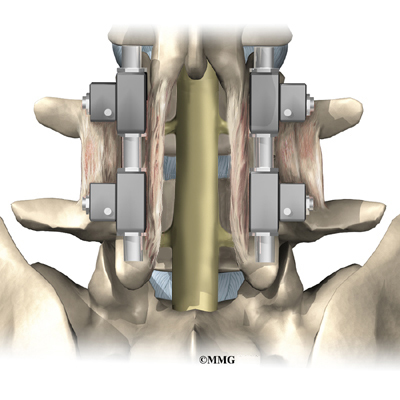 Posterior fusion surgery requires bone to be grafted onto the spinal column. 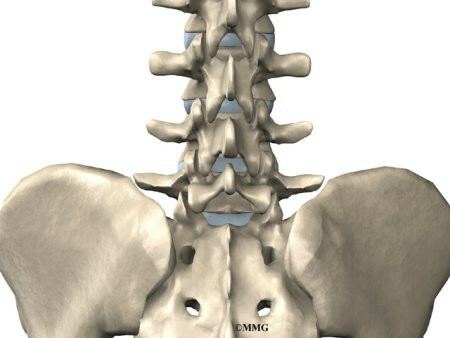 The graft is commonly taken from the top rim of the pelvis. There is a risk of pain, infection, or weakness in the area where the graft is taken. Sometimes the strips of bone graft don't take and end up dissolving. A second surgery may be needed to remove the strips and apply more graft material. The doctor may need to apply additional metal hardware to hold the new grafts firmly in place. When instrumentation is used, the screws, rods, or plates can also cause problems. They can loosen and irritate the nearby soft tissues. In rare cases, they may actually break. If your hardware loosens or breaks, the surgeon may suggest another surgery either to take out the hardware or to add more hardware to solve the problem. During the operation, the surgeon lifts off the small muscles that run along the back of the spinal column. Some of the nerves going to the muscles are cut. Lifting the muscles away from the bone impairs the blood supply to the muscles. Disruption of the nerve and blood supply can cause the muscles to fatigue easily, especially during a long work day and with heavy or repeated lifting. Exercises designed by a physical therapist boost strength and endurance in the nearby muscles, reducing symptoms from this problem. Sometimes the bones do not fuse as planned. This is called a nonunion, or pseudarthrosis. (The term pseudarthrosis means false joint.) When more than one level of the spine is fused at one time, there is a greater chance that nonunion will occur. Fusion of more than one level means that two or more consecutive discs are removed and replaced with bone graft. If the joint motion from a nonunion causes pain, you may need a second operation. In the second procedure, the surgeon usually adds more bone graft. Metal plates and screws may also be added to rigidly secure the bones so they will fuse together. Posterior lumbar fusion is a complex surgery. Not all patients get complete pain relief with this procedure. Successful fusion occurs in more than 80 percent of surgeries. But a solid fusion does not guarantee freedom from pain or the ability to return to normal activity. If you have pain that continues or becomes unbearable, talk to your surgeon about treatments that can help control your pain. Patients may be placed in a rigid body brace after surgery. This brace may not be needed if the surgeon attached metal hardware to the spine during the surgery. The drain tube is removed from the wound within 24 to 48 hours. Patients usually stay in the hospital after surgery for up to one week. During this time, a physical therapist helps patients learn safe ways to move, dress, and do activities without putting extra strain on the back. Patients may be instructed to use a walker for the first day or two. Before going home, patients are shown how to help control pain and avoid problems. Patients are able to return home when their medical condition is stable. However, they are usually required to keep their activities to a minimum in order to give the graft time to heal. Patients should avoid bending, lifting, twisting, driving, and prolonged sitting for up to six weeks. Outpatient physical therapy usually starts a minimum of six weeks after surgery. Patients gradually do more activities and exercise with the goal of getting back to a normal and productive life. Rehabilitation after posterior lumbar fusion can be a slow process. Many surgeons prescribe outpatient physical therapy beginning a minimum of six weeks after surgery. This delay is needed to make sure the fusion is taking. You will probably need to attend therapy sessions for two to three months. You should expect full recovery to take up to eight months. Therapy can usually progress faster in patients who had an instrumented fusion. Active treatments are slowly added. These include exercises for improving heart and lung function. Short, slow walks are generally safe to start with after posterior lumbar fusion. Swimming and use of a stair-climbing machine are helpful in the later phases of treatment. Therapists also teach patients specific exercises to help tone and control the muscles that stabilize the low back. Your therapist also works with you on how to move and do activities. This form of treatment, called body mechanics, is used to help you develop new movement habits. This training helps you keep your back in safe positions as you go about your work and daily activities. Training includes positions you use when sitting, lying, standing, and walking. You'll also work on safe body mechanics for lifting, carrying, pushing, and pulling. As your condition improves, the therapist tailors your program to help prepare you to go back to work. Some patients are not able to go back to a previous job that requires strenuous tasks. Your therapist may suggest changes in job tasks that enable you to go back to your previous job or to do alternate forms of work. You'll learn to do these tasks in new ways that keep your back safe and free of strain. Before your therapy sessions end, your therapist will teach you how to avoid future problems.